Nachos, how I love thee, let me count the ways. I have always loved nachos, but my early memories of nachos didn’t look this grand. My grandma made nachos once in a blue moon and those were similar to these — very simple made with homemade tortilla chips, refried beans, jalapeños, and cheese, and baked. That was it, simple and delicious. Then there were the nachos that I craved at every church bazaar, movie theater, and festival — the nachos made with stale tortilla chips drenched in neon yellow goo, with a heaping mountain of canned jalapeños. My stomach is turning and burning just thinking about them. Every time I see those nachos I remember some funny teenage memories. My mom sold those same nasty cheddar cheese nachos at our grocery store, Soza’s Grocery. Wow, they were popular and I loved them too. In high school every Friday night my cousin Erika would spend the night and we couldn’t wait to make our mountain of nachos and stay up late to eat them as we watched Friday Night Videos. This was before MTV or VH1 — we had to wait till Friday night to watch music videos. Afterwards we’d talk and giggle all night long as we listened to the radio on my boom box with a cassette recorder nearby waiting to record our favorite songs to make some mix tapes. Wow, how times have changed. As teenagers we were never concerned about our weight. We just ate and enjoyed food without any regrets. I kind of miss those days and not having a care in the world. After college I worked as a waitress at a pub and they served some mouth-watering nachos. This was one of my first experiences with real nachos. Those nachos were a tall stack of fresh ingredients like grilled steak or chicken, beans, tomatoes, onions, fresh jalapenos, and real cheese, and baked to perfection. Then they were served with a side of fresh guacamole and sour cream. Once I experienced those nachos I started making them at home and never turned back. Ok I’m lying; I still crave those nasty nachos with the ooey-gooey yellow gross cheese with tons of pickled jalapeños especially at the movie theater or a festival and regrettably still eat them on occasion. My stomach can’t handle them anymore and I immediately tell myself I’ll never eat them again…until the next time. I usually have great self control, but for some reason I can’t resist nachos, of any kind. However, if I had to recommend a nacho recipe I would highly recommend these and not the nasty artificial processed cheese kind. 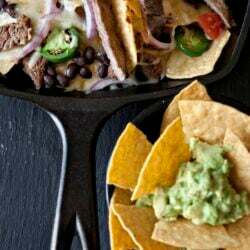 These nachos are made with black beans, carne asada, fresh toppings and a luscious mountain of home made guacamole. 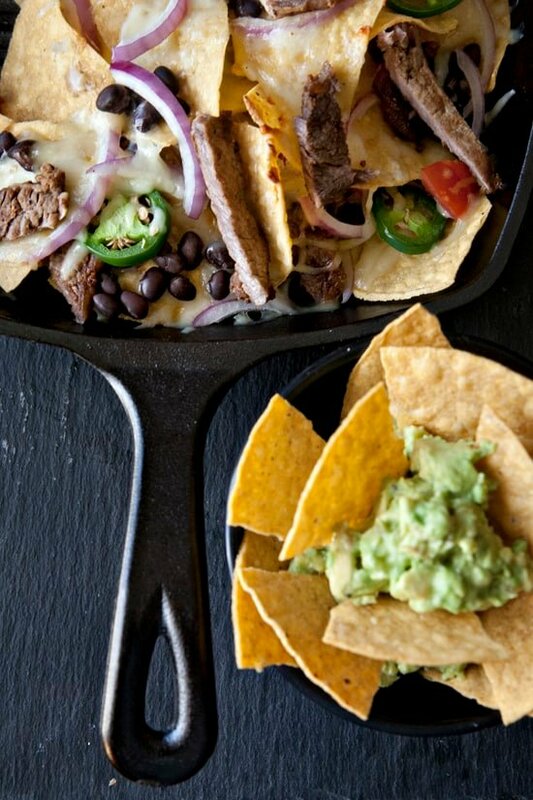 These show stopping nachos are a hit and perfecto for your Super Bowl party. I know I will be making these along with some hot wings, mini-tamale pies, chile con queso, and Mexican-style pizzas. Preheat oven to 350 degrees F. Place your tortilla chips across the bottom of your cast iron skillet or baking sheet lined with parchment paper. Add beans evenly across the chips; sprinkle the grilled carne asada, shredded cheese, onions, tomatoes, and jalapeño slices across the chips evenly. Repeat to build layers if you’re feeding a crowd. Bake until the cheese is melted and bubbling and veggies are warm, about 15 minutes for a single layer or 20 minutes for multiple layers. Serve immediately with your favorite toppings and don’t forget the guacamole. While the nachos are baking, make the guacamole. Cut the avocado in half. Twist to pull apart and remove the pit. Scoop out the flesh. Place in a medium bowl and mash the avocado with a fork leaving some chunks. Add the garlic, onion, jalapeño (optional), salt, and tomato (optional). Squeeze the lime juice over all the ingredients and give everything a gentle stir, but don’t overdo it. Disclosure: This is a sponsored post by Avocados from Mexico. We were compensated for recipe development. The views and opinions expressed about the product are purely our own and based upon our personal experiences. We are thrilled to partner with brands, which we think are an ideal fit for us and you our awesome readers. This has long been a standby in our house for a quick dinner or a midnight snack. Unfortunately ours aren’t always this delicious looking. Most often my teenage son throws a handful of tortilla chips on a cookie sheet and tops them with all the cheese we have in the house and broils the whole thing. He would think he had died and gone to heaven with a plate of yours. Yum, they look wonderful. Those nachos are beautifully loaded. I know where I want to go to watch the Super Bowl! What a fabulous dish! Really scrumptious looking. OM Gosh I am so glad to have found your site – you must have so much fun doing what you love and being together – can’t wait to flip thru your cookbook and try your recipes – I love the pictures and the way you talk us thru them! Welcome to our blog Jennifer! We are so glad you found us! 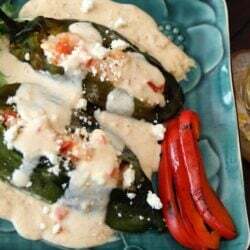 Keep us posted on your Muy Bueno cooking adventures and please be sure to follow us on facebook and share some of your kitchen creations with us. Yeah Nachos!!! I love how you can customize your nachos to suit so many occasions. They are perfect for a football game for sure. Yours look great and what a nice photograph. I entered the contest, thanks! Best of luck Holly! It is quite the prize package. I’m with you on the nacho love – absolutely my favorite party snack! 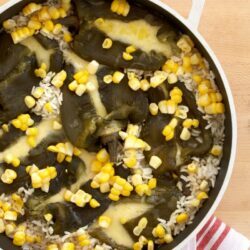 This recipe looks fabulous, good enough to serve for dinner! LOL! Actually, I think I had to twist your arm a time or two to eat those wonderfully sinful nachos every Friday night. It was nice to be able to eat to our hearts content without ever worrying about calories, fat or carbs. 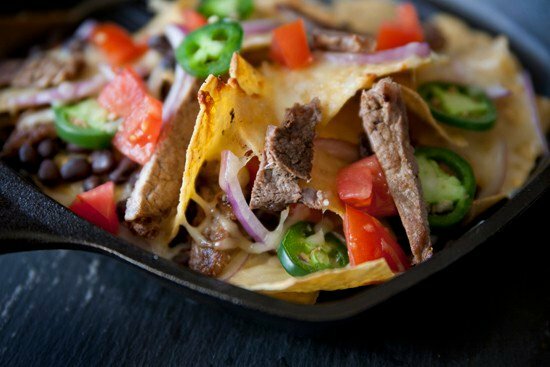 I still crave those same nachos from time to time; however, I think I’ll make this recipe next time I sit down with the hubby to watch VH1 Classic “Pop-Up Videos”. I love all our fun teenage memories! That could be a book all on its own. Ahhh the good ol’ days. Miss you cuzin! Thank you Laura! Have a yummy Super Bowl! I still love the “nuclear cheese nachos” .. they actually remind me of u and old days when would walk home from school and put all of our money together to buy those nachos and a big gulp.. almost everyday. I had some not to long ago.. and they took me right back there.. they were so good.. but I don’t have them to often either. Oh Lordy — 7-11 and Dairy Queen nachos oh my. Its a good thing we walked home after school (1.5 miles) to walk off those nasty nachos. LOL! Hysterical! Oh, I will be trying these for sure. Sound delicious! Thank you Amanda! Buen provecho! Avocados make me so happy! Your post/blog has brought back so many memories. I discovered you on the Homesick Texan blog. I too was born in El Paso, lived in Texas most of my life and now transplanted in Michigan. Your recipes have brought warmth and comfort to me. They have re-ignited my passion to keep alive those recipes I too learned from my Grandmother and my Father – also from El Paso. I laughed at your yellow cheese comments, I too secretly indulge at times. 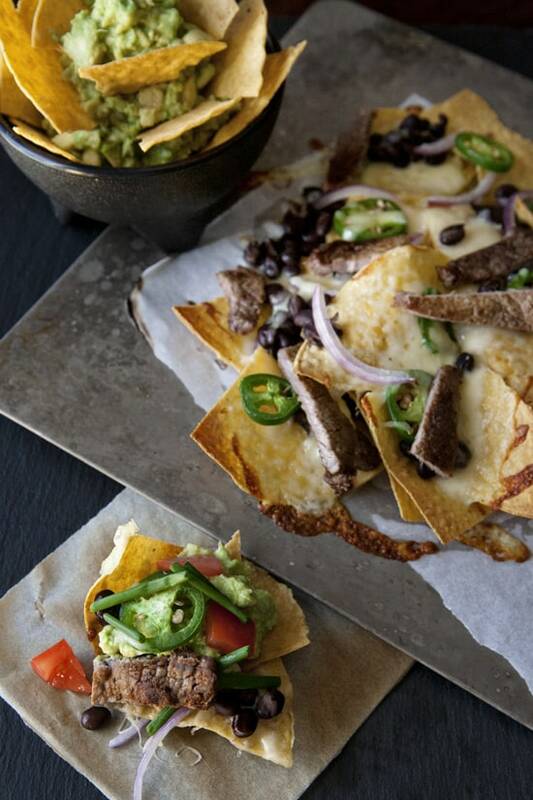 In San Antonio there are a couple of places that do the Carne Asada layered nachos…so fresh and yummy. Alas there are also some “Fruiterias” that have the ooey, gooey yellow versions too. 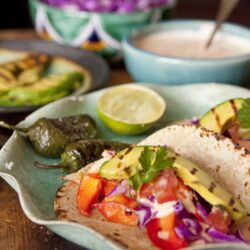 I am educating my British/Italian husband on the varieties and differences of Mexican food; the BIG difference between Mexican avocados and the “other” av ocados; and the ties between Mexican food and holidays…tortas de carmaron, capirotada and Easter,etc. Best of luck for continued success! Can’t wait to keep reading! Well hello Rose from El Paso! So glad you found us! I have a feeling you would LOVE our printed cookbook. It is a beautiful collection of all of our favorite dishes — most not on this blog. I have a feeling your hubby would love all the special dishes too. 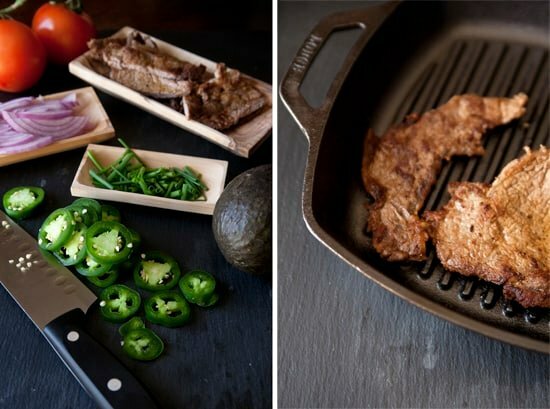 I cannot get the image of how good this looks, and the blackened skillet just tops it. I am making this right now! Wow, that looks really good. I’ve got a recipe for Asado (it’s Texas style or so I’m told) that has some of the best juice ever. I swear I could swim in it. Trim excess fat if any, cut into 1″ pieces, brown meat in dutch oven or heavy pot in bacon grease. just enough to cover bottom of pan. place meat, garlic, and onion in pot together until lightly browned.add enough water to cover meat, add bullion cubes, cumin, pepper, and tomato sauce. Cover and simmer on low until tender, about 1 1/2 hrs. toward end of cooking time flour can be added to thicken. Dip out with slotted spoon to serve on flour tortillas. Carne Asada and Asado are quite different. We have a delicious Asado de Chile Colorado (Pork in Red Chile Sauce) in our printed cookbook. It is sooo amazing!